The primary role of a gypsum handling system is to transfer material safely and efficiently from one location to another. The primary role of a gypsum handling system is to transfer material safely and efficiently from one location to another. While this functionality is universal regardless of industry, the equipment is not considered to be all-purpose, one-size-fits-all solutions. A prime example of this is gypsum, which is a unique material that varies based on its source and processing stage in the manufacturing cycle. As a result, even straightforward equipment such as gypsum conveyors should be examined to ensure a reliable, value-added solution is being utilized to enhance individual manufacturing systems. When it comes to designing a system to best handle the characteristics of gypsum, the biggest concern is material build-up. Gypsum is not a free-flowing material; it tends to be sticky and, as a result, requires additional maintenance and cleaning within a gypsum handling system. The best way to avoid build-up and maintenance issues is through consistent equipment cleaning as part of the equipment’s regular maintenance. Belts in a belt conveyor system are constantly in contact with gypsum and, consequently, are the most important areas to maintain. A number of belt cleaner systems are available for preventing material issues based on equipment and application specifications. Regardless of what system is used, regular belt cleaning prevents roller build-up and ensures consistent material discharge from the gypsum conveyor belt. Belt conveyors are commonly used to transport material via a continuously moving belt surface. Its reliability and versatility lends itself to a wide range of material handling systems, with synthetic gypsum and naturally occurring gypsum being two common applications. FEECO offers customization features such as belt trippers and belt cleaning systems as well as a wide range of conveyor design options to suit any gypsum application. For example, a smooth top belt conveyor option works well in many gypsum applications, and therefore has been used in several recent, large-scale FEECO projects. Multiple belt conveyors in a variety of sizes were used to transport synthetic gypsum and limestone throughout a power production plant in Kansas. For more information on the Gypsum Limestone Conveying System project profile, click on the link above or download the PDF. A tripper, also known as a traveling belt tripper, or belt tripper, complements belt conveyor systems by transporting and discharging material from any location on the belt of a conveying system. While belt conveyors only move material from the initial starting point to the end of the belt, the addition of a tripper provides the ability to create a pile anywhere along the length of the belt or unload inventory in a long, continuous pile. As an added benefit, employing long form pile management assists in maintaining desired gypsum moisture levels, making a tripper conveyor a commonly preferred handling solution for many indoor and outdoor gypsum storage applications. Six conveyors in a variety of sizes were used to transport synthetic gypsum throughout a power plant in Georgia. Two traveling belt trippers enhanced the material handling system’s capabilities and assisted in creating ‘under roof’ storage within the power generation facility. For more information on the Gypsum Conveying System project profile, click on the link above or download the PDF. A bucket elevator may also be used in facilities that process mined gypsum. For applications such as gypsum, a continuous bucket elevator with a single or double chain is recommended in order to handle the high capacity of material that typically needs to be conveyed. 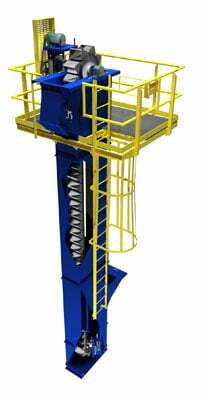 The bucket elevator transports material vertically at a low speed, and can be customized to meet a wide range of height requirements. Conveying gypsum in a manufacturing facility can be an invaluable part of the overall process, adding flexibility, efficiency, and automation to an otherwise difficult task. In order to meet performance expectations, maintain reliable machinery, and extend the life of gypsum conveyors, it is important to plan for gypsum’s unique material characteristics as equipment is being selected and made. With over 65 years of experience in the gypsum industry, FEECO knows how to design and manufacture quality equipment capable of successfully handling gypsum in any application. For more information regarding FEECO’s extensive gypsum equipment and process knowledge, contact us today! Tim Matzke is a bulk solids material handling expert.